This is an Old beautifully woven piece of Kuba Cloth that comes from the Kuba Tribal people of Zaire. Kuba cloth is woven from raffia palm leaves. Production of the fine decorative textile is a series of endeavors engaging both men and women. The men are responsible for the growing, tending, harvesting and weaving of the cloth. The women are responsible for preparing it for decoration by pounding the stiff, rough cloth in a large wooden mortar until softened, for hemming and in some cases, treatment with brown, wine-red, black blue or yellow dye from local plant sources. The women create the cut pile embroidered panels as well. The men's dancing skirts are significantly longer than that of the women’s, sometimes having distinct borders with fringe and raffia bobbles. Some of the decorative techniques incorporated by both men and women are applique and reverse applique, dyeing, tie-dyeing and resisted-dyeing, certain types of embroidery as well as patchwork. Patchwork in Kuba cloth came about because of the softening process. The pounding would cause holes to develop in the cloth that would need to be repaired; thus patchwork would be used. To further enhance the look and to balance the visual effect, other patches of various geometric designs were added. Some dancing skirts can take up to two years before all the cloth needed to finish the skirt has been gathered. The Kuba peoples primary contemporary use of the cloth is at funerals of wealthy elders. The traditional techniques used to create the cloth have survived because of these funerals, enabling us to continue to enjoy the extraordinary creative Kuba textiles. 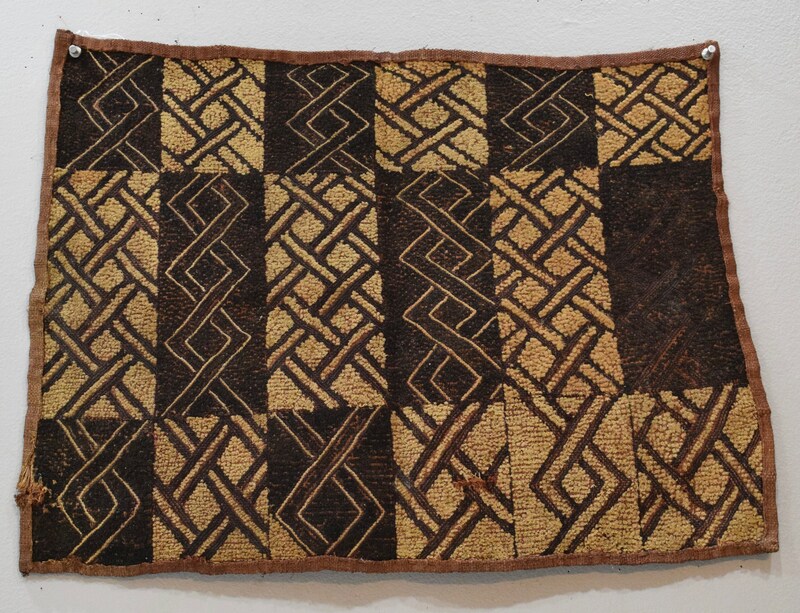 This Kuba Cloth would be beautiful framed on a wall in your home or to add to your collection. 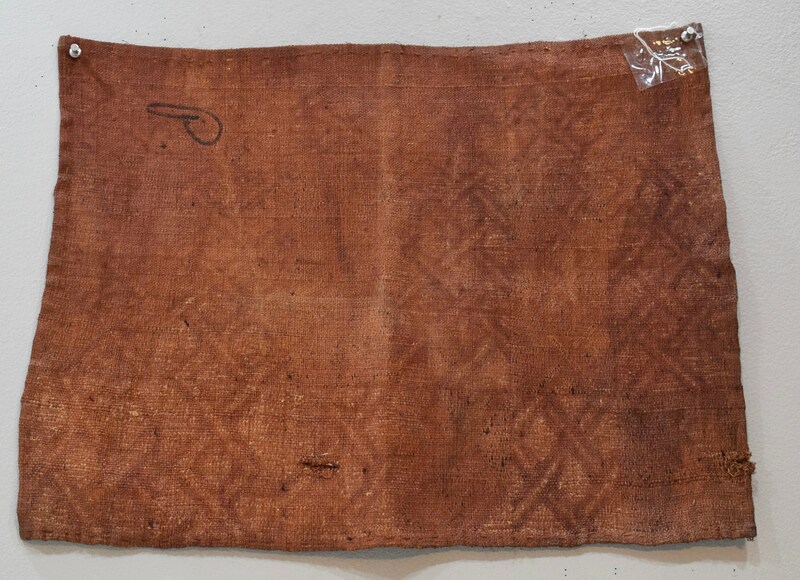 This Kuba cloth shows some age, but is in good condition.